Recently LoveToKnow had the opportunity to speak with Jodi Lenocker, President of the American Hatpin Society, about how to identify an authentic antique hatpin as well as the hatpins she has in her collection. LTK: How did you become interested in collecting? JL: My husband and I started out collecting old Edison phonographs, circa early 1900s. By the time you have several phonographs, a few phonograph stands, and large morning glory horns, space to display them becomes an issue. We simply did not have room to acquire more. In 1990, I was looking for something small to collect when I toured an old Craftsman style home on a "Walking Tour" of Orange, a city in Orange County, CA. In the house were bouquets of hatpins in hatpin holders scattered throughout the house. I was smitten. I had no idea there were so many beautiful types of hatpins. Not long afterward I walked into one of the antique stores in "Old Towne" Orange and saw a wonderful assortment of hatpins for sale. It turns out the house I had toured belonged to the store's owner, Deena Zachritz, and she collected and sold hatpins. She was quick to share her considerable knowledge of hatpins and she referred me to the American Hatpin Society, which I joined. I learned a great deal from being a member of the club, and I am currently the President. LTK: Do you have a favorite in your collection? JL: My favorite is the hatpin my husband surprised me with in 1991, early in my collecting days. I had told him about a $400.00 hatpin I had seen at Deena's store and forgot I had even mentioned it to him. At that time I could not even imagine paying that kind of money for a hatpin. Imagine my surprise when he gave it to me for Valentine's Day. I was pleased by the pretty brass ball, and was admiring it when he reminded me it was the hatpin that opens up to a compass inside. It was then I realized he had bought that really expensive hatpin. I was just overwhelmed, by the hatpin and the gesture of love it represented. For years I did not know if it was a brass hatpin or a gold hatpin. We had it tested when the electronic gold testers came out and learned it is solid 16k gold. It has a coral bead at the base of the hatpin. It is not marked, so we do not know who made it. I would date it around 1905 or so. LTK: How commonly are reproductions sold as authentic antique hatpins? JL: Unfortunately, it is all too common. I love to go antiquing, but I do not really expect to find a good hatpin in the "run-of-the-mill" antique store. I even have trouble finding authentic hatpin holders and hatpins display best in hatpin holders. When I am in antiques stores or antique malls, I find some really poor quality hatpins that may be authentic, but they are not good examples of period hatpins. Usually in the same holder there are "beads-on-a-stick". These "fantasy" hatpins are recently made hatpins of contemporary glass and metal beads. They do not resemble any period hatpin. Occasionally, I see what would be termed a "marriage", which is a vintage button or brooch that has been made into a hatpin, with an authentic hatpin stem. So, while both the head and the stem are vintage, it was not a hatpin originally. I see these same types of hatpins on eBay. There is an excellent article posted on the American Hatpin Society web site called Fake Hatpins and Holders by Frankie Ramsden. I recommend it highly. LTK: What are some details that the would-be-collector should look for? JL: The would-be-collector would do best to look at a lot of period hatpins and become educated regarding jewelry styles and construction during the hatpin era, which occurred during the late Victorian era and the Edwardian era. For instance, rhinestones were usually prong set or bezel set, they were not glued in. The rhinestones tended to have high tables (where the top is cut off the stone; contemporary rhinestones have low tables, being cut down lower on the stone). Turn the hatpin over and look at the construction on the back. The "finding" is the piece that joins the hatpin head to the stem. Is the finding of the type used during that time? Some of the newly made findings are really earring backs from the 1970's. Is the finding centered properly in the middle of the back of the hatpin? If the finding is part of a "bridge", is the bridge properly centered and in good repair. A sign of a marriage is a finding that is not typical of the hatpin era joining a real hatpin stem to a period button or brooch. Sometimes you can see two marks on the brooch back were the brooch pin was once attached. I just saw "hatpins" for sale on eBay that were brooches, but the underside showed contemporary colored beads as findings. Those brooches were not authentic hatpins. I always look to see if solder was used to join the finding to the so called "hatpin" head. Authentic hatpins do not show solder, except for the military buttons made into hatpins during World War I. Being aware of colors that were typical of that era, such an amethyst and amber, versus garish reds, is helpful. Also, one has to consider how the hatpin would look when put through a hat. If the hatpin head would not display well in a hat or would be too heavy for the hat, it is probably not an authentic hatpin. In regards to stems, there was no stainless steel during that time, so you should not be buying hatpins with stainless steel stems. LTK: What are the best ways to identify an authentic antique hatpin? JL: Even after one has become educated and has learned what was typical of hatpin styles and construction during the hatpin era, a suspect hatpin can generate lively discussion and disagreement among veteran collectors. LTK: Are online sources, such as eBay, a good venue for buying hatpins? JL: I do occasionally buy hatpins on eBay. There are so many fake hatpins for sale on eBay that one really has to be aware of this and be prepared to study the hatpin and the seller's spiel really well. Some of the fakes are cheap, so just the price alone may be a giveaway. Attractive newly made hatpins are coming out of Eastern Europe that dismay veteran collectors. The color of the stones and the construction of the backs are not authentic. However, to the uninformed, they look authentic. We are concerned that these newly made hatpins will find their way into the regular marketplace and start showing up at antique stores and antique malls. These fakes dilute the value of your authentic hatpins. Be aware that every "antique" or "vintage" hatpin is not necessarily antique or vintage and stay away from sellers who will not refund your money if you are not satisfied. LTK: Do you have any tips for the novice hatpin collector? JL: It helps if the novice can see a lot of authentic hatpins in someone's collection or in the hands of a reputable hatpin dealer. If the novice is not in a location where they can see lots of hatpins, I recommend getting Lillian Baker's "The Collector's Encyclopedia of Hatpins and Hatpin Holders" published by Collector Books in 1976. It is available on the secondary market and sometimes on eBay. In regards to a reference for jewelry in general during the Late Victorian and Edwardian era, I recommend the book "Estate Jewelry 1760-1960" by Diana Sanders Cinamon, published by Schiffer in 2009. It is a very good history of jewelry including the different styles, construction, gems, and materials. Several of my hatpins are featured in the book and the photographs are enlarged so you can see good detail on the various hatpins." I recommend joining the American Hatpin Society. The AHS publishes a newsletter four times a year, and it includes 3 color pages of member's hatpins and hatpin holders. 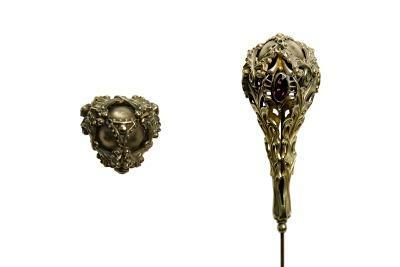 There are descriptions of the hatpins and holders and collectors may see items like ones they have in their collection. It helps collectors get a feel for the variety of hatpins that were made during that era, the materials they were made of, and the various styles. The articles help increase the collector's knowledge as well. The American Hatpin Society has quarterly meetings in Fountain Valley, California and there is an informative speaker at each meeting. On October 14-16, 2011 there is going to be a Hatpin Gathering in Wheaton Village, New Jersey. There will be several speakers, reputable hatpin dealers, and friendly collectors willing to share their knowledge.